Neosho, MO – The Crowder College Board of Trustees has unanimously voted to select Dr. Glenn Coltharp as the next President of Crowder College. Dr. Coltharp has thirty-seven years of experience in the education profession. He has been Vice President of Academic Affairs at Crowder for the past seven year. Prior to coming to Crowder, Coltharp was the Dean of the School of Education, Teacher Education Department Head, and Professor of Teacher Education at Missouri Southern State University. Prior to going into higher education, Coltharp served at the K-12 level as a superintendent, assistant superintendent, middle school and elementary principal. In addition, Dr. Coltharp was Principal of the Missouri State School for the Severely Handicapped. Before serving in administration he taught kindergarten, second, and fourth grades. Dr. Coltharp received his Bachelor of Science degree in Elementary Education, his Master of Science degree in Elementary School Administration, and a Specialist degree in Education and School Administration, all from Pittsburg State University. Coltharp received his Doctorate degree in School Administration from Kansas State University. Dr. Coltharp currently serves on the Missouri Department of Higher Education Council of Chief Academic Officers, representing community colleges in the State of Missouri. He also serves on the Missouri Advisory Board for Educator Preparation representing higher education, and is working with the Missouri Department of Elementary and Secondary Education to strengthen teacher education in Missouri. Dr. Coltharp is married to Dr. Hazel Coltharp, who is a professor in the mathematics department at Pittsburg State University. Together, they have two children, Dr. Jean Coltharp, is an assistant professor in the mathematics department at MSSU and Benjamin Coltharp, a senior at PSU. 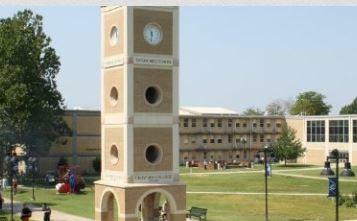 He was selected by the Crowder Board of Trustees after a national search. Nearly forty applications were considered by the Presidential Search committee, who narrowed the field down to four finalists. Each of the finalists came to campus for personal interviews with the Board as well as a public forum.